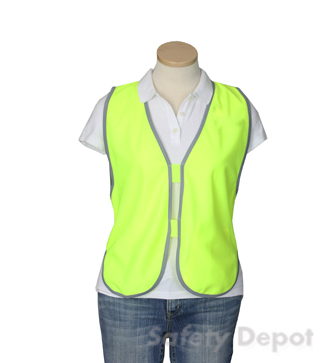 Made with 100% polyester, this sleeveless, black safety vest is perfect for any woman working at an event or just searching to identify a certain group. It is lightweight, durable and has two velcro front closures. It's bright lime/yellow is perfect for custom screening of any logo or text of your choice.It has been custom tailored to cinch at the wait for an amazing fit. Available in red, royal blue, light blue, pink, black, gray, orange, green, purple and white. 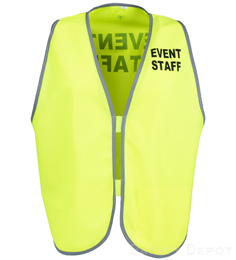 Also available for prescreened “Event Staff”.